Sometimes when it's rainy, there's no better place than being at home. In your pyjamas. Eating chocolate. All from the comfort of your bed. So hearing the rain when I woke up, I understood Celia's early morning query about whether we were still catching up. But I found the rain oppressive that day and I was so excited about leaving the house that I told her that it was just rain. As if I hadn't used rain as an excuse to bury myself under a quilt at other times! 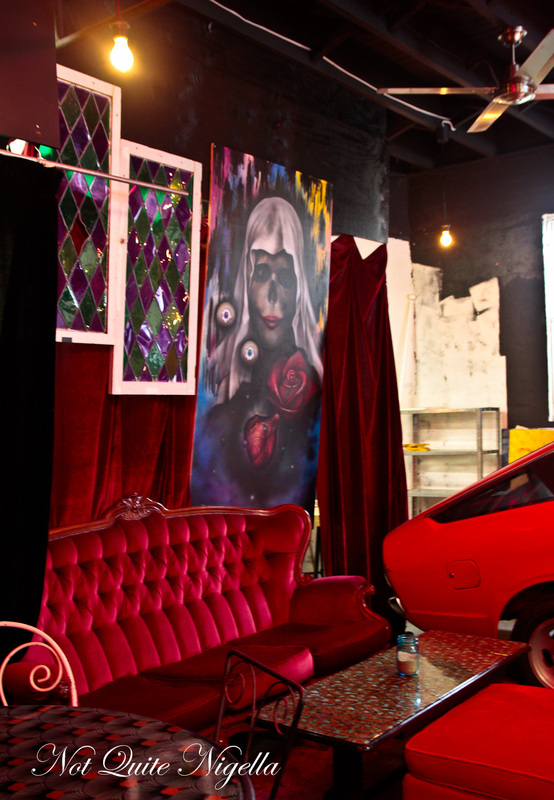 Velvet Garage is kind of hidden away, an almost secret spot. 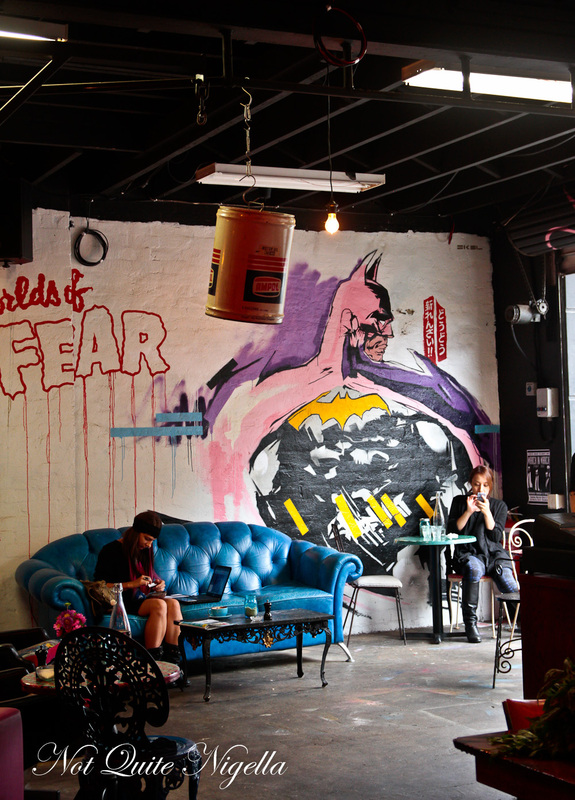 Near to Sydney Park it's on a quiet street the size of a lane way or alley way amongst colourful graffiti sprayed walls. When I walk in, the welcome is genuine and I'm offered a pick of the seats as I've arrived just before lunchtime. It's a serious question to consider. There are plenty of places to park your bottom but it's the cluster of red velvet wing back chairs and lounge that call the most. I take a look at the menu and wait for Celia and Pete to arrive which they do a few minutes later. Celia collapses into a wing back chair. "I'm just going to stay here all day okay?" Celia says wearily. 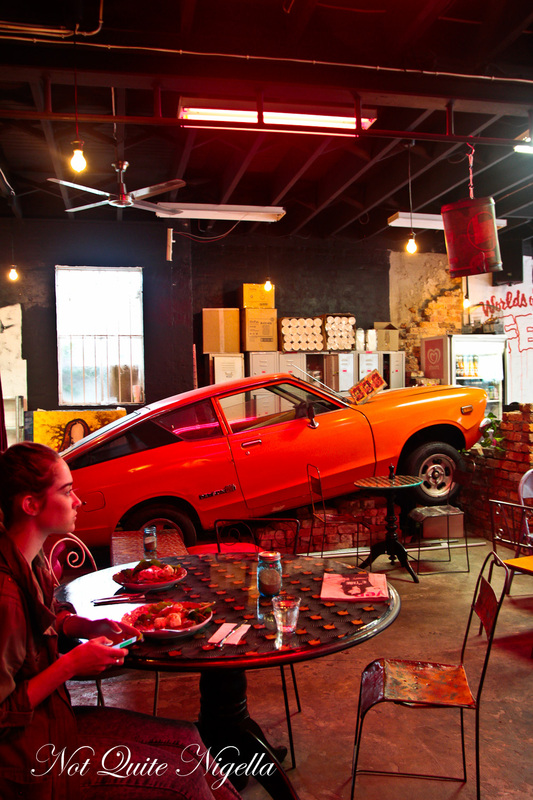 The decor is eclectic with a tangerine orange Datsun 120Y in one corner, its grill filled with flowers and toys. 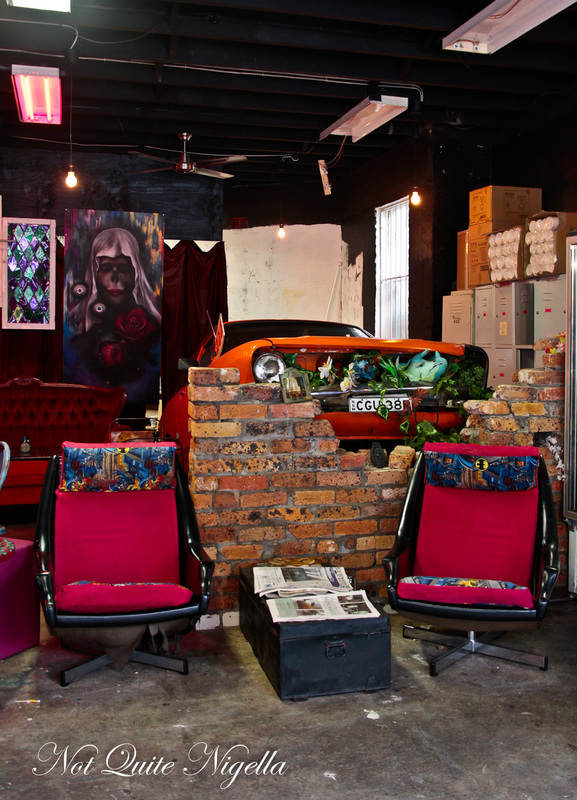 There are oil tins and vintage tables and chairs so artfully mismatched that they go together well. The space was formerly an IT office and then a gym. 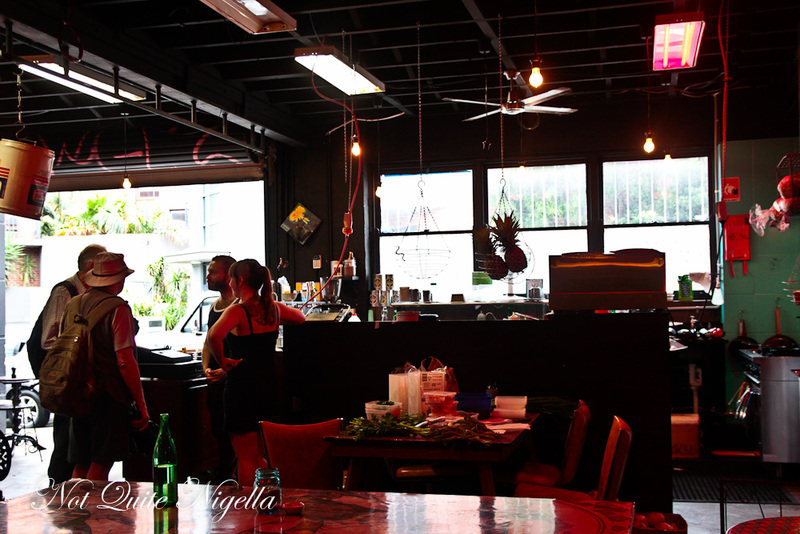 They rent spaces to other businesses in the back too including Little Flowers, a business that delivers a bunch of flowers for just $25 including delivery (yes we were nosy and had a peek). 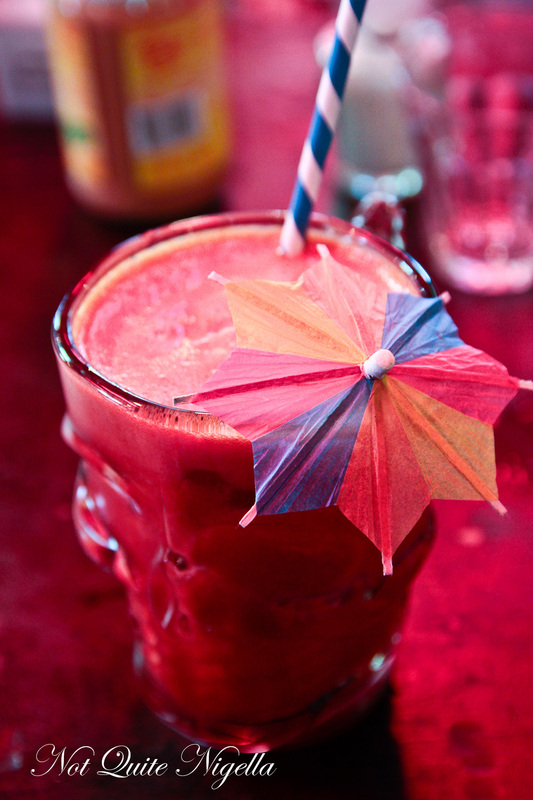 I start with a juice and it's served to me in a skull mug with a blue and white wax straw and umbrella, just the way I'd like all drinks to be served to me. It's a combination I first tried in Johannesburg and loved so much but you don't often see pear juice on the menu. It's delicious and just the right combination of sweet and earthy. It's a good sized serve too and I can't finish it all. 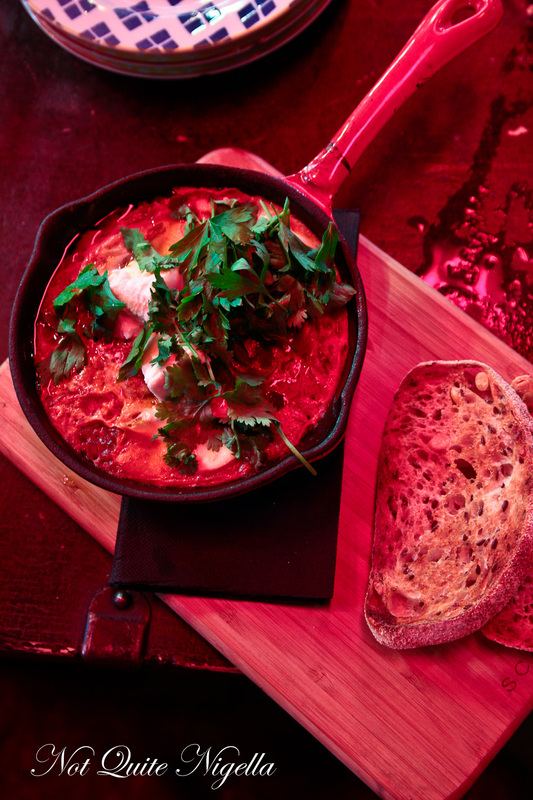 We dig into the shakshuka. Here it is served in a pan with plenty of eggplant, red peppers, spiced tomato, onion, goat's chevre with silky eggs on top. It's Pete's favourite item and we all enjoy the hearty, flavoursome dish. The main reason why we ordered the Sage Rage was because the table next to us ordered one each and it smelt so good that we had to order it. 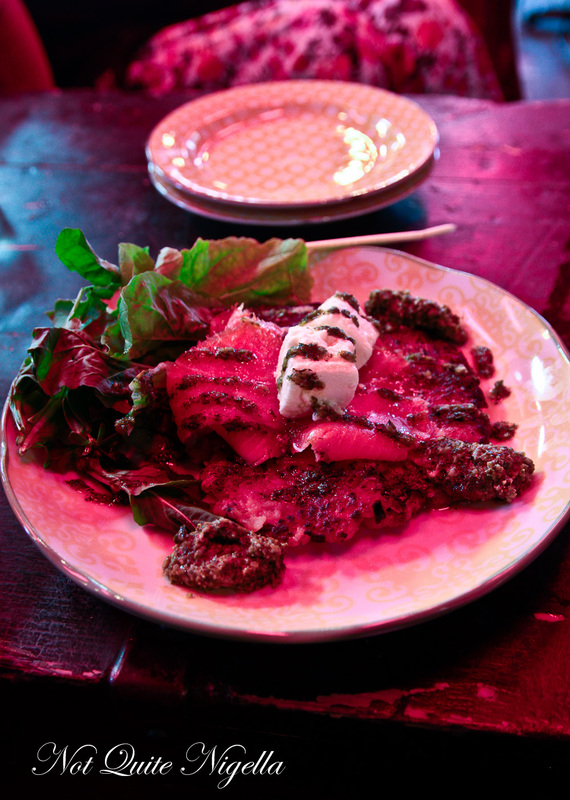 The sage is contained within the potato rosti cake and it is topped with smoked trout, salsa verde, herb oil, feta with large leaves of mild rocket on the side. The rosti isn't quite as crisp as I usually like it but it's still fantastic with the salsa verde and creamy feta cubes giving the rosti and smoked trout a pronounced savouriness. I do love a good toasted sandwich especially with the chillier weather coming through and this is definitely a goody. The lightly toasted bread is brushed with oil and filled with slow cooked lamb (just emerged out of the oven), gruyere, red cabbage and Granny Smith slaw. 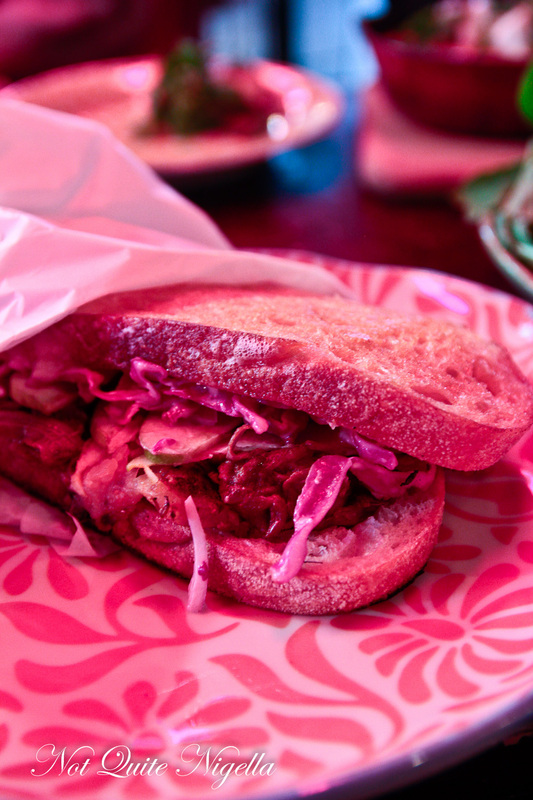 The rich lamb benefits from the tart freshness of the thinly sliced Granny Smith and red cabbage and I could have happily eaten this entire sandwich all to myself. Pete knows me too well and when he mentions a sweet course we decide to order the French Boy, an indulgent French toast. 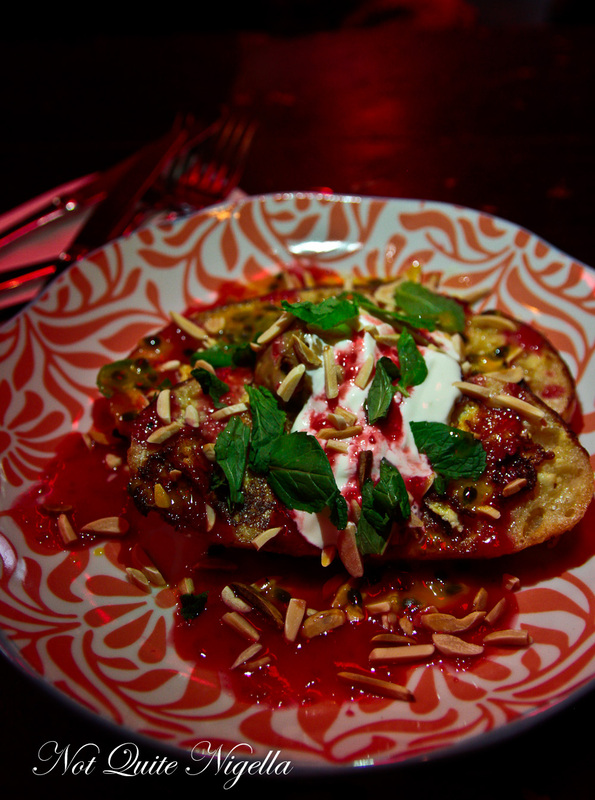 Made up of two slices of bread dipped in egg and cream and pan fried, it is topped with a scoop of thick dulce de leche caramel, yogurt, passionfruit, raspberry and rosewater drizzle, mint and slivered, toasted almonds. If you like it tangy and fresh, you can bypass the dulce de leche while if you like it a bit sweeter, scoop up a little of that sweet caramel and raise a fork to your waiting mouth. So tell me Dear Reader, have you ever cancelled plans because it was raining? Did you make up an excuse or blame it on the rain (reference to Milli Vanilli song is coincidental)? And dulce de leche-are you a fan? restaurantBacon Lovers Unite! A Bacon Lovers Menu & Sydney's Bacon Festival! restaurant Bacon Lovers Unite! A Bacon Lovers Menu & Sydney's Bacon Festival!